Owning your own wedding planning business is the holy grail for all wedding planners. There’s nothing like knowing that you are in control of your own destiny and your business is running like a well-oiled machine. If you find yourself wishing you owned your own business but just didn’t have the money, don’t stress. Many wedding planners who currently own their own business didn’t start out that way. They got their start just like everyone else: by getting a job as a wedding planner. There are a variety of businesses that hire wedding planners and with a little creativity, you can get your foot in the door just like many of those that came before you. In this article, I’ll go over the different possibilities for those of us looking for wedding planner jobs. The first step is to write a great resume, which is all about knowing your audience. Since you’ll be applying to become a wedding planner, you’ll want to focus on anything you have done which shows skills in creativity (especially in written and oral communication), time management, attention to detail, and working with the public. If you do not have a lot of work experience that showcases these areas, highlight school courses, volunteer work, or hobbies that do. Have several people review your resume for errors. You’d be surprised how many times I’ve reviewed job applications with typos strewn all over the page. You can imagine where those resumes ended up. Most online applications and some in-person applications require personal and/or business references. As a rule, never use a relative as a reference and try to use three references from different areas of your life. For example, do not use all teachers or all co-workers as your references, or you risk being perceived as one-dimensional and inexperienced. Make sure to ask the person if they mind if you use them as a reference and ask them for the phone number and email address they would prefer to contacted at. Brief your references beforehand and let them know they may be receiving a phone call from a potential employer. Kindly ask them to highlight your relevant strengths during the phone interview (again, creativity, time management, and attention to detail). Most wedding and event planning companies hire wedding planner assistants or interns. Attend a local wedding show and introduce yourself in person to the wedding planners (with your resume in hand, of course). If it’s a well-known company in your area, you may want to offer your services for free (for a limited time, of course) or at the very least offer to come back and help them pack up their booth at the end of the show. Again, get creative and be willing to go the extra mile to prove you are passionate about being a wedding planner and working for them. Another way of getting to know a local wedding planner is to offer to help a friend that has hired a wedding planner with their wedding. An extra pair of hands is always needed on wedding day, especially if there is a lot of set up to do at the reception. Come for the day and make your self invaluable. Let the wedding planner know your credentials and give them a copy of your resume when it’s all over. It is a lot easier to hire someone you have worked with for a day, than someone who is simply a name on a resume that came in the mail. Wedding planners like to hire based on chemistry as much as on credentials, so establishing a personal relationship before the business owner even opens your resume is a huge head start. Many wedding photographers, videographers and florists offer their brides day-of coordination or full service planning for an additional fee. What vendors often discover is that if there is no assigned wedding planner, they will end up having to coordinate the wedding whether they want to or not. Charging an extra fee for wedding planning services makes this extra effort worth their while, and their brides end up happier for it. These types of vendors are an excellent and under-utilized resource for find a wedding planner job and gain valuable experience. You can approach them at a wedding show as discussed previously or join a local wedding vendor association or wedding vendor network group. Be sure and have professional business cards printed and ready to hand out at these networking opportunities and don’t forget to collect business cards from the people you meet as well. If these vendors have not thought of offering this add-on service, gently suggest it. You just might get your first wedding planning job. Did you know that most hotels, large resorts and country clubs have an event or wedding planner on staff? This position may be in the food and beverage department and be titled “Conventions Set Up Supervisor” or “Banquet Set Up Supervisor.” It may also be in the group sales department and be listed as “Wedding/Catering Sales Manager,” “Event Planning Coordinator” or “Event Marketing Coordinator.” Many of these businesses will hire interns or assistants in the summer or during their peak seasons. Any one of these would be a great opportunity to gain experience and a good reference, or even get hired on as a full time employee. These positions can be found on the different online job search engines like Monster and CareerBuilder. If you’re the type to take matters into your own hands (and as a wedding planner, you probably should be! ), go directly to your local resorts and country clubs and ask to see the food and beverage supervisor or group sales manager. If you’ve done your homework, you’ll already know the name of the person of interest (through a quick online search), and you’ll have your properly-addresses cover letter in hand, ready to be hand-delivered. Working for someone else, while not the ultimate dream of most aspiring wedding planners, is the fastest and safest way to gain experience in the wedding planner industry. 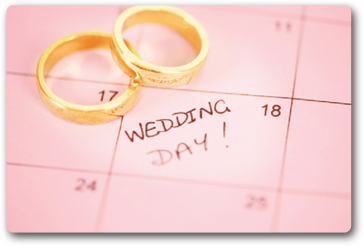 Remember that most brides will hire their wedding planner when they set their wedding date, which is typically one year or more in advance. Thus, it can take 1 to 2 years to get your business off the ground and get enough weddings completed to have an impressive website or portfolio. By working for someone else at the start, you can quickly begin planning weddings, gain experience and develop a professional portfolio of weddings you’ve helped plan. Not to mention bringing home a paycheck too! With enough experience, it won’t be long before you’re the one doing the hiring. Good luck! 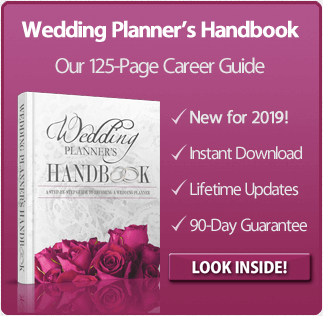 Previous post: How Much Do Wedding Planners Make?